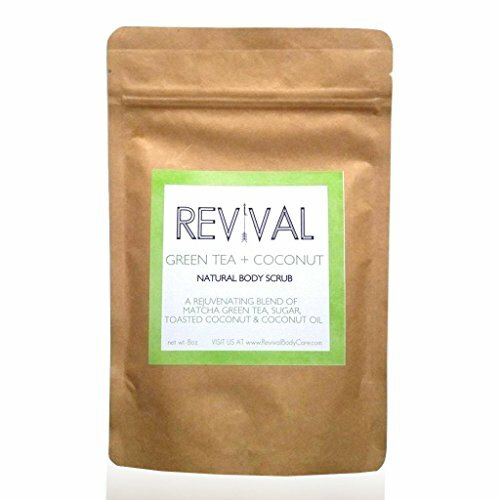 Why we love it: Give your skin extra love with this non-toxic, completely vegan Green Tea and Coconut body scrub from Revival. Fair trade organic Sugar gently buffs away dead skin cells and impurities to reveal a radiant glow. Organic Virgin Coconut Oil improves skin elasticity, heals capillaries, reduces age spots and is anti-bacterial. Matcha Green Tea reduces inflammation while pulling out toxins from the skin for an overall healthier complexion. Gently massage into the skin using a circular motion. Leave on for 5-10 minutes and rinse well. Revival is ALL Natural, Non-Toxic, Chemical Free, Cruelty Free and Vegan! Each blend is carefully curated to create a scrub that is gentle yet effective on the skin. Every ingredient has a purpose…no fillers!